Looking for a casual Mediterranean restaurant near Kingsway? Che Baba is a great option for you. Receiving a gift in January when you thought the holidays were over…quite the thrill, no? This is how I felt, leaning against throw pillows, listening to ‘chill tunes’ as Che Baba’sFrench Canadian co-owner placed my picture perfect Brunch Tartine before me. 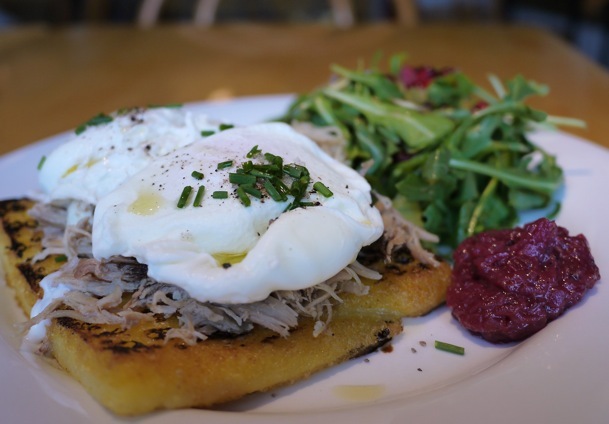 The brand new ‘cantina’, touting predominantly Southern French cuisine, offers salads, tartines (open-faced sandwiches with an option of gluten free polenta), light breakfast options, and desserts. With an adjoining yoga studio, one might expect smoothies and a slew of healthy salads. Nope. Customers are welcomed to modify their meals, however. My Brunch Tartine was quite perfect as is, featuring incredible house made polenta that, to the touch, almost felt like jelly with a firm, slightly charred exterior. Soft-poached eggs made for a delicious yokey sauce, mixed with spoonfuls of cranberry caramelized onion compote and tender, non-oily strands of duck. A delightfully soft artisan mint macaron was icing on the cake as I paid. Residents of Mount Pleasant have a new great dining option.